Depending on where you live in Washington, DC, you may have only small spaces to work with in your yard. Small yards can easily lead to disappointment when it comes to landscaping. Thankfully, there are methods to help you create great backyard landscapes for small spaces, allowing you to enjoy your yard by working with what you have. This technique works particularly well for a small backyard where you want to spend time on your patio without getting an eye full of your neighbors’ yards. Plant larger bushes around the perimeter of your yard. These bushes will grow and hide the area surrounding your home, giving you a cozy little place to enjoy cook-outs and time with your family without being disturbed by things going on around your home. A great way to draw attention away from the size of your space is to make things interesting. You can do this by choosing unique plants and bright colors. Split up the yard with several smaller plant beds to make the space seem larger. You can also make the space more interesting by creating a patio with uniquely shaped pavers. The amount of space you have won’t matter when you use the space correctly and make it interesting. When you feel you don’t even have enough space to plant some flowering plants or bushes, you can make use of the space you have by planting flowering vines. These vines will wind their way up fences, arbors and anything else they can attach to so you can enjoy the beautiful flowers without using up precious ground space. When you landscape for small spaces, it is important to create a focal point to draw attention to a specific point. For instance, set up a tall planter in the middle of the yard or the patio and fill it with bright flowers. This will draw attention away from the size of your yard and focus attention right where you want it. 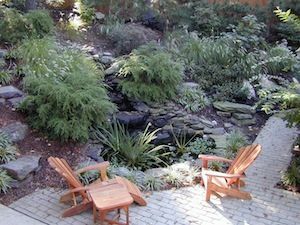 When you have a small yard, you don’t have to give up on the idea of creating effective backyard landscapes. Following these tips and talking to the professionals will help you make the most of the space you have and enjoy your yard the way you’ve always wanted. Contact us for help with your next landscaping project, especially for smaller spaces.